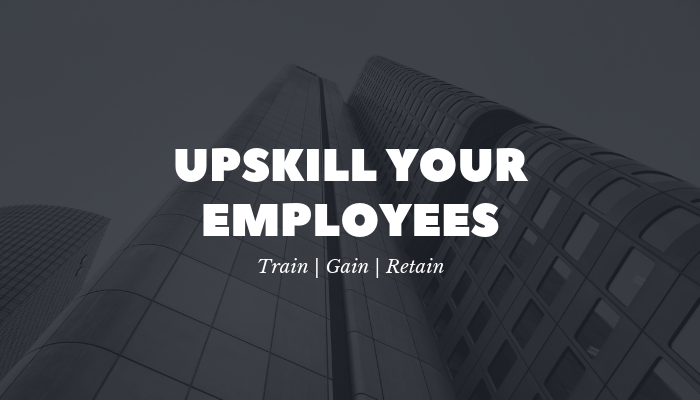 Upskilling is the practice of building certain skills that are not necessarily required for the job you are directly doing, but can still help to improve your employees personal or professional life. It can also involve the development of skills beyond what is mandatory. Let’s say you work as a sales associate. Perhaps daily duties include possibly following up new leads over the phone. You can choose to upskill yourself by building your negotiation & influencing skills or perhaps client relationship skills which you may not need for the immediate role but helps to add value to what you do going forward. No two employees are the same. When you employed them, they each have different skillset required for the role in which you recruited them for. Which is why it is vital to create a personalised ‘Individual upskilling plan’ for each member of your team going forward. Empower them to identify what skills they are lacking and what they feel they need to be learning further, to excel in their role. Upskilling is and will always be a very personal endeavour, because everyone has unique interests and talents that align with certain skills. For example, an employee who wants to work on their interpersonal abilities might want to focus on their communication skills. However, that may not appeal to someone who would prefer to build their technical skills. The key to a successful upskilling plan is making it learner-centric and ensuring it is individualised. As much as it is important to personalize the upskilling plan, it is just as important to make sure you focus the new skills development which the employee can use on a regular basis. This adds greater value to their existing role, allowing them to work with greater strength and flexibility. For instance, let’s say a marketing associate who has a primary duty of developing promotional material for the business. She may want to focus on developing research or analytical skills to add greater value to her role. As research allows more targeted marketing and analytics allows the results and impact of the marketing to be measured more accurately. Ask your employees to write down every task and process that they carry out on a daily basis, and then develop their job-specific upskilling plan using the list as a guide. One of the most effective ways to approach upskilling is to tackle one skill or skill set at a time, instead of trying to build several skills all at once. Assess the employee’s current abilities and compare them to their skill goal. You can then provide online training sessions and materials that cater to their individual needs rather than generalized exercises that may not support their upskilling efforts. Once they have developed the skill, they can then move onto the next online training or session and so on. I’ve worked with many companies to develop a regular upskilling online training programme, to work with your employees to develop further skills in areas that are relevant to their role and areas of interest. Whether that be a single one off session or a full custom programme of 3, 6 or 12 sessions online (one per month to keep employees active and regularly engaged in learning and development). If your organisation is keen to work with me to develop a custom online training programme for your employees, then please do get in touch. If you would like to have a consultation for a potential training programme, I’d be happy to discuss this further with you. Let’s connect and be remember to reward your employees with regular support and training that matter to them and their personal growth. That is the key to keeping employees happy and ensuring employee retention.